Transform your desk in a flash to a sit-stand workstation. Reap the health rewards of the most ergonomically-sound converters in the industry. Explore iMovR's ZipLift and Cadence lines today. Visit Selecting the Right Desk Converter for You for a buyer's guide to our desk converter models. Zip! You've never been standing faster, or healthier. Three models, three rhythms. Catch your own standing beat. These ultra-flexible standing desk converters adjust across 3 dimensions, save desk space, and make screen-sharing simple. New Low Price! Welcome to the ultimate in ergonomic flexibility. 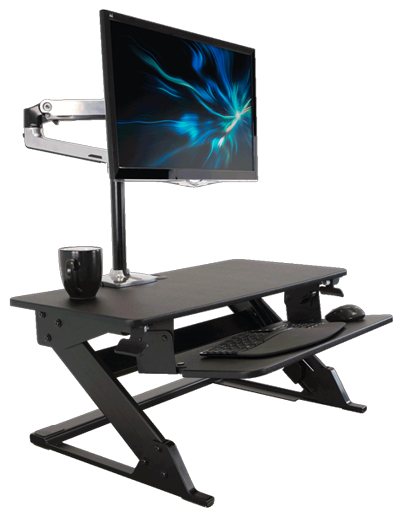 The Cadence Pro from iMovR is the most widely-adjustable desk converter in the market. Moving smoothly within a 52" hemisphere, it makes collaborating with coworkers simple while saving you valuable desktop space. Its tilting ergonomic keyboard tray and easy monitor adjustment enable pain-free, productive work. The Cadence Express combines elegant design with durability, adjustability, and best-in-class stability—all at an affordable price. Stand or sit at work with the Cadence Plus, a two-tiered desk converter that hovers over your desk surface and allows users to experience the health benefits of standing at work. Combining elegant design aesthetics, durability, adjustability and best-in-class stability in one affordable unit. 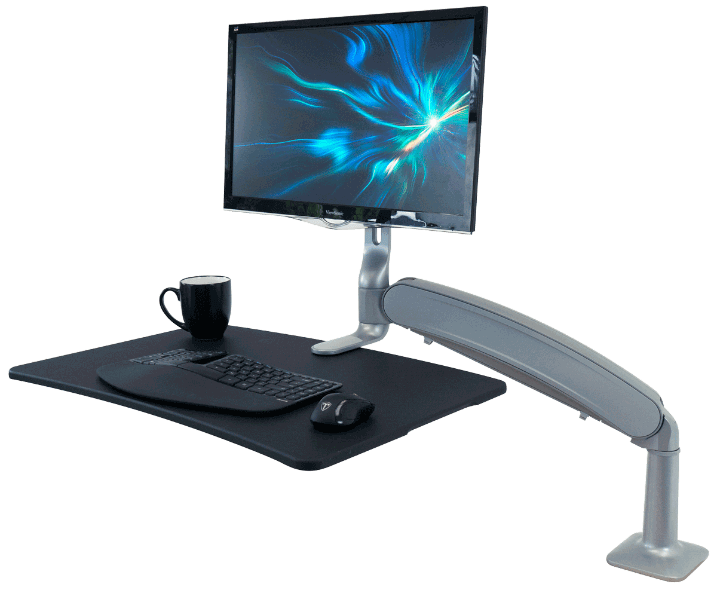 The Cadence Plus offers ultra-flexibility for your workstation using a gas-assisted counter-balance arm with 180-degree rotation and 22" height range. Not everyone has the space or budget for a standing desk. Or perhaps you have a built-in desk, or one with drawers you really want to keep. Now there's a solution: the standing desk converter—it'll get you standing, and allow you to keep your existing desk! 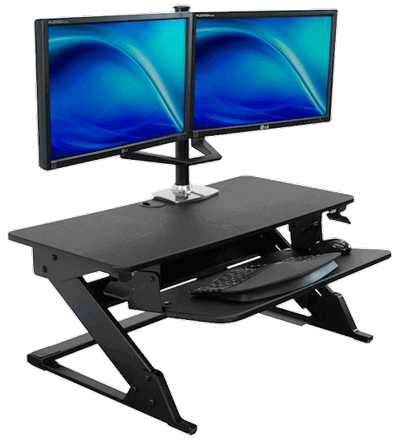 All our standing desk converters feature a 30-day, 100% satisfaction guarantee, and ship for free to anywhere in the continental United States. They can also be shipped to Alaska, Hawaii, Canada, or anywhere else in the world.